ETS provides a range of services and resources which support the design of great student learning experiences. Want to learn more about Learning Design in practice? Are you developing or revising an online course? Want to embed technology in your face to face class? To learn more about Learning Design and the services we offer, see the sections below. “Learning Design refers to ways in which educators can document, model, implement, store, share, adapt and reuse pedagogical ideas” (Bennett, Agostinho, & Lockyer, 2016). This includes the process of creating student learning experiences based on identified learning outcomes and empirically supported learning theories. Similar to Instructional Design, which focuses on designing instruction, learning design is an emerging area of practice that speaks more to learner-centred approaches of teaching and learning. Using an established instructional design model as a framework, the interactions involved in teaching and learning along with work completed and artefacts created, are mapped out and eventually implemented to ensure learning has occurred. While we cannot design learning itself, we can design FOR learning. This series of resources provide guidances on major aspects of designing for learning, including writing learning outcomes, constructive alignment and designing assessments, formative activities and learning materials. Read more about Designing for Learning. Models of Instructional / Learning / Educational design can guide the work involved in creating great learning experiences. At ETS, we use an expanded version of the ADDIE model, which includes the basic aspects of Backwards Design. Courses can be offered in many different ways, on a spectrum from face-to-face to blended and fully online, with a variety of tools and teaching strategies used to support each learning experience. Read more about different course modalities here. The Faculty of Education has a couple of new learning spaces which can facilitate both online and in-person collaborative experiences. Read more about the space. ETS is piloting a new course development process rooted in the ADDIE model, with several key steps built in to ensure learning experiences are designed and implemented with an alignment to outcomes in mind. Working with instructors and course developers in a reflective process, ETS’ instructional designers work together to design the learners’ pathway through a course, from how assessment tasks will support learning outcomes, to how learners acquire specific knowledge and skills to support successful mastery of outcomes. Course Developer: Instructor, faculty member or subject matter expert (SME) undertaking the course revision or development. Learning Designer: ETS staff member tasked with supporting and guiding the course revision or development process. 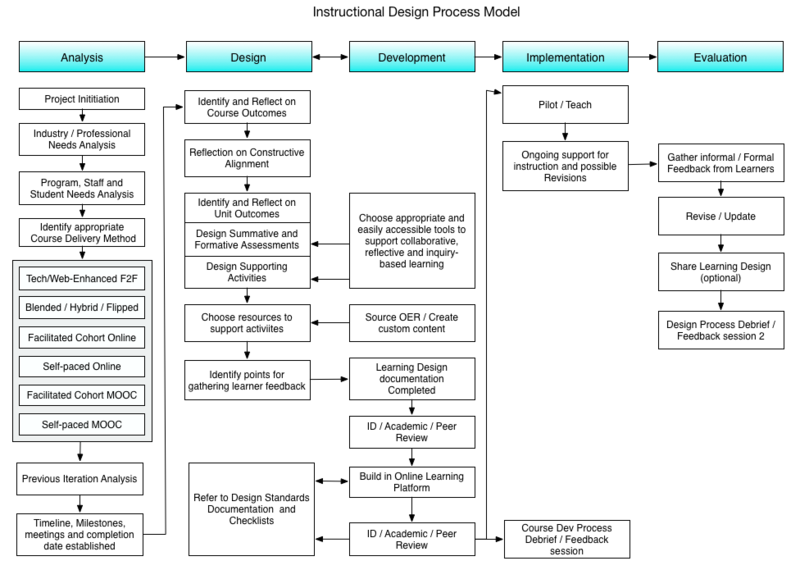 For a detailed look at our course development process, check out the full workflow here and download a detailed description of the process and associated worksheets here. Full Development: This involves a full redevelopment, looking at all aspects of how the course is put together, including revisiting course learning objectives, revising assessments to ensure outcomes are measured appropriately, and to source and / or develop materials that align to these assessments and outcomes. Learning design is first completed offline, with feedback provided by Academic Reviewers related to intellectual / academic rigor, then a canvas course build is completed. Delivery Model Adaptation / Assignments Revision: This development focuses mainly on a change in modality (e.g., Face-to-face > online) where assignments and content may be adapted to suit the new modality, or simply a revision of assessment tasks without revisiting learning outcomes or content. Course Content Creation / Updating: This project work revolves around the Course Developer sourcing or creating new content for the course, with no work done to revise outcomes or assessments. Course Visual Redesign: This type of project focuses on an aesthetic or structural redesign of an existing course. Course Developers are supported by ETS to ensure usability, accessibility and logical content flow and student pathways through a course. Academic Review 1 Dept Head or Faculty Member who is knowledgeable in the subject area reviews the draft syllabus, providing feedback before the course is built in Canvas. This is intended to allow for pedagogical and subject matter revisions to ensure academic rigour. Through ongoing support, ETS provides academic staff within the Faculty of Education, the opportunity to share their practice with hosted events, showcasing innovations in learning. ETS also provides services related to data collection, ethics, privacy and other issues relating to working with human participants and the use of technology in education. The Technology Enhanced Classroom (TEC) Expo is an annual event designed to showcase and celebrate creative and innovative uses of technology in face-to-face, blended, and online classrooms within the Faculty of Education. A portion of the TEC Expo event is dedicated to Makerspaces. The Makerspaces provide opportunities to share hands-on making, and coding activities with the audience. UBC’s Centre for Teaching, Learning and Technology (CTLT) supports a vibrant SOTL Community of Practice, which supports SoTL practices at UBC through meetings, workshops and networking opportunities.